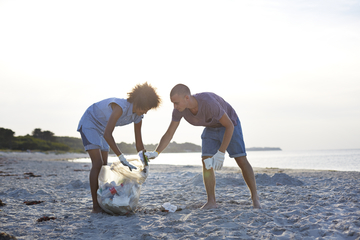 Did you know approximately 75% of ocean litter comes from land based waste? According to the National Waste Information Baseline study, the Western Cape accounted for an estimated 20% (21.6 million tonnes) of the waste generated in South Africa in 2011, of which 55% (11.8 million tonnes) was general waste. Although the Department of Environmental Affairs and Development Planning has identified that waste data varies greatly, this is significantly higher than the 2016 estimates of 4 million tonnes municipal solid waste in 2015. As shocking as these statistics are, you can help make a difference by recycling unwanted items at home, school and at work and buy products made with recycled materials. By being environmentally conscious, we can build a sustainable future for many generations to come. As the global population grows, the demand for resources increases. Everything we use - from computers to cellphones - gets made from natural resources or plastic. This demand exerts too much pressure on our environment, depletes our natural resources and causes irreversable damage to the world's ecosystems, especially in wetlands and oceans. Recycling eases the pressure we exert on our natural environment. Instead of exploiting our environment for more resources, we reuse existing plastic, paper and other materials. Plastic was created to be long lasting and durable. We can reuse most plastic items multiple times. It is wasteful to dump these items in the bin. Also, by choosing recycling over dumping, we will decrease the amount of waste that ends up at our overflowing landfills. Recycling also reduces our carbon emissions, and creates jobs in a fast growing and exciting green economy. Single-use plastic waste, such as food containers or cold drink bottles, is our biggest challenge. Most plastics can be collected and recycled. Recycling is one of the best ways for us positively impact the environment. Learning how to curb our wasteful habits and stop littering makes a huge difference in creating a cleaner and healthier environment for all. If you’d like to learn more about recycling and what items can and can’t be recycled, have a look at this quick and easy list Cape Town Green Map has put together. If you have unwanted recyclable material in and around your home, school or workplace consider dropping them off at any one of these drop-off sites in the Western Cape. For general information about waste collection contact your local municipality or go to one of these drop off sites. If you are residing in Cape Town, the City of Cape Town has an app that gives you the location of your closest recycling plant. If you want to join a grassroots community committed to cleaning up the environment, the Cape Town Beach Clean-up, an initiative that gets volunteers together every first Saturday of the month to clean up our beaches. 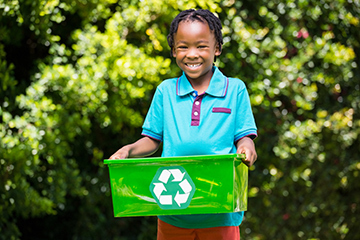 For more information about recycling, and where you can recycle, please visit the Cape Town Green Map. For a more detailed look into the country and the Western Cape’s waste management landscape, read the full 2017 Green Cape Waste Economy Market Intelligence Report.